VETERAN Bundist and Jewish Socialists' Group member Majer Bogdanski died in September 2005 at the age of 93. Born in the Polish industrial city of Lodz, Majer became aware of workers' struggles and Jewish resistance to oppression at an early age, joining the youth movement of the Bund. During the Second World War he survived the Soviet gulag and fought in Italy, while his fiance and family back in Poland perished in the Holocaust. After the war, settling in London's East End, earning his living as a tailor, and joining the Labour Party, and later the JSG. He also became a stalwart of Yiddish music and culture, which the Nazis and Stalin had done so much to destroy. At a memorial meeting for Majer in November 2005 there were tributes from at home and abroad. From New York University, Dr Gail Malmgreen wrote: 'Majer was a delightful person and an inspiration to many. He kept the dream of a better and more beautiful world alive in the worst of times.' . 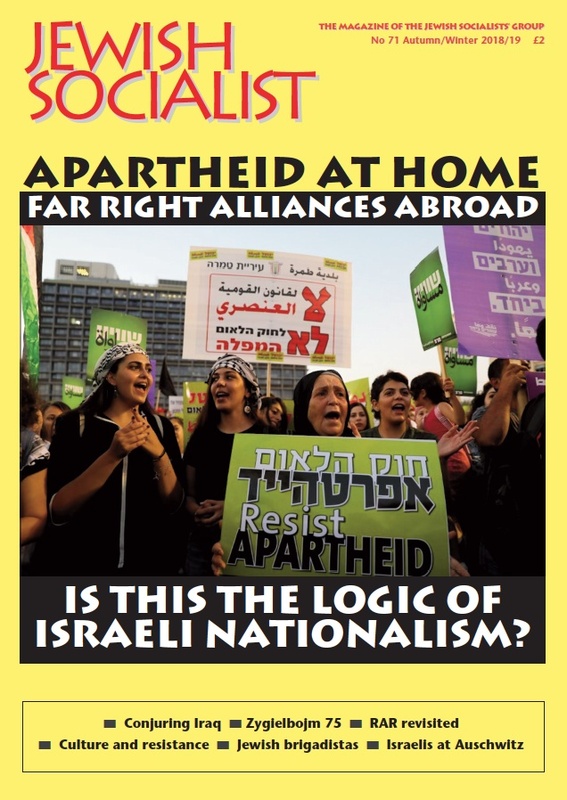 We are posting some of the tributes to Majer Bogdanski from that meeting, which were previously published in Jewish Socialist magazine. I first became aware of Majer in the early 1980s. I was already a member of the Jewish Socialists’ Group and our group was growing closer and closer to Bundist ideas and increasingly interested in Yiddish culture. I had made a personal decision to strengthen my own limited knowledge of Yiddish and I started to go to Yiddish evening classes. As part of my self- education I went with a friend in 1983 to a commemoration of the Warsaw Ghetto uprising organised by the Friends of Yiddish. We attracted some attention, being at least one generation younger than most people in the room. We were both knocked out by the power and emotion of the event. My friend could follow some of what was said from studying German at school, I could follow some of the Yiddish, too, but most of it did not need translation. We could feel the loss, the mourning, the pride in resistance and the dedication to remembering. Nothing that nigh: was more powerful than the songs of a snw: but striking looking man tvith white mu combed back - someone I had heard :: but had not met. As he sang his lace e :: red and a vein protruded on his to red cm, His songs sent a shiver through me O course, that man was Majer. We were briefly introduced to him. He was pleased to see us but also a bit bemused to hear that young Jewish socialists, keen on Yiddish, really existed. The revival of interest in Yiddish among younger people in Britain had barely begun at that time. We stayed in touch, and a couple of years later, when the Jewish Socialists' Group had raised its profile, launched a magazine and, with help from Ken Livingstone’s GLC, started to do its own work to promote Yiddish culture, we invited Majer to speak to the group. I can hear his voice from that meeting as if it were yesterday. It was electrifying. It was a life-changing meeting for us and also for Majer. We had a theoretical understanding of the ideas of Bundism but that is not the same as meeting a real life Bundist. He was a living link with a movement that had made a revolution in Jewish life and made such efforts to make a revolution in the wider society, only to be dealt a murderous blow by both Nazism and Stalinism. Majer grew up in a time when for so many Jewish workers and even many of the more privileged educated middle class to be a Jew and a socialist was as natural as breathing the air. The post-War decades were not kind to those who survived with those values intact. The newly dominant forces in the Jewish community - whether those embracing capitalist opportunity, religious ghettoisation or a cultural reorientation through Zionism to Israel above all - all contrived to marginalise the Yiddishists. the socialists, the secularists, the internationalists, the Jews who believed in a common humanity. Majer had maintained his values. Most of the movement he shared them with had perished. But he discovered that there was a new audience for these ideas and values. That was the beginning of Majer's association with the JSG. He was a loyal and active member for nearly twenty years until he died. He wrote for our magazine, he spoke at our meetings, - especially our own commemoration of the Warsaw ghetto uprising - and was a regular at our own annual policy conference where he was always listened to with both respect and pleasure. He was argumentative and stubborn and persistent but always argued his point from principle and with honesty. Growing up in me Bund he had the utmost respect for democratic ways of working. The Bund itself had made the most powerful strides forward in inter- war Poland, while maintaining two distinct political factions within it - the eynsers and tsveyers.When Majer disagreed with a view or a motion he never ever, questioned the motives of the proposer but would argue a point purely on its intellectual and practical merits. He was a delight at our group’s social events - usually bringing a Yiddish story to share which he had painstakingly translated to maintain all the richness and pathos of the original language. He would also make sure that he spoke with the youngest people present - the children. He loved being around children - he wanted to hear their voices and know what they were interested in. But it was also because children were the future and, while we learned so much about history from Majer, he was always concerned with the present and the future. In our magazine he wrote a beautiful article about his time as a 21-year-old in the Bund, being put in charge of a very lively group of 10-16 year olds - Skifistn, the Bund’s children’s section. For Majer, one dreadful statistic that summed up the destruction of the world he grew up in was the handful of Skifistn that survived from a 750-strong group in Lodz in 1939. Individually and with other members of the JSG I had many opportunities for long conversations with Majer and many opportunities to hear him speak and see the world through his eyes. At the core of his beliefs was egalitarianism - a belief that all human beings are of equal worth, He would listen respectfully to those with more economic power than him or more educational qualifications but-he never believed that made them superior; and neither were those condemned by lack of opportunity to play the most menial roles in society in any way inferior. He loved learning :but he said to me that Bundists strove to be educated workers. They did not aspire to join the middle classes but wanted the educational benefits they had to be available to all. He believed the best combination was to be determined to learn and study and being productive through labour. He was at his most passionate as a speaker when speaking about the period of the Nazi genocide. A critical Israeli writer, Boaz Evron, once observed that two tragedies befell the Jewish people in the 20th century - the Holocaust and the lniterpretation of the Holocaust. Many Jews said: ‘Never again will this happen to: the Jews', rather than, 'Never again will this happen to anybody.’ Majer was one who stood apart from the mainstream and was determined to learn the lessens for humanity. Every time I heard Majer speak: on this subject I heard him talk about how the Gypsies had been exterminated alongside the Jews and for the same reasons. I heard him say how we must build a world where, despite our differences, people had to learn to live in harmony and with humanity. I heard him talk about pride and shame - his pride in the face-to-face Jewish resistance against indescribable odds, not only in the Warsaw Ghetto but also in other ghettoes and even in the concentration camps. And his shame that in the 1960s, while Eichman was being brought to trial in Israel, Israeli schools taught impressionable children that the diaspora Jews, the friends and neighbours of their parents and grandparents, had gone like lambs to the slaughter. He hated this lie and was not afraid to say so. He supported labour and socialist parties all over the world but he had some harsh words for certain individuals within the Israeli Labour Party. Majer never forgave Ben Gurion for an incident that happened during the war at a meeting where a Polish Jew gave an account in Yiddish of the atrocities the Nazis were committing. Ben gurion interrupted to say he couldn't bear to hear this harsh grating language. That language - Yiddish - was Majer’s mame loshn, mother tongue. He didn’t think it was special; he wasn’t sentimental about it; he was just determined to speak it and to preserve it when it came under murderous threats from Nazism, Stalinism, assimilationism and, ironically, even Jewish nationalism. His determination to be a resistance fighter for Yiddish was not just theoretical but practical - through the Friends of Yiddish, through talks to other Yiddish circles, through collecting Yiddish poems and putting them to music he personally made an enormous contribution to sustaining and developing Yiddish culture. At JSG conferences he would often lead us at the end of the meeting in singing the Internationale in Yiddish. It took more than three years for a plaque to be put up but it was undoubtedly worth it and it was a very proud moment for Majer, who had known Zygielbojm personally. On the day it was unveiled, he was delighted to be among Zygielbojm's family who had flown from America for the occasion, but what also gave him great pleasure was the presence of the then Polish Ambassador, Ryszard Stemplowski, and his wife, Irena. Before becoming Ambassador, Ryszard Stemplowski had been an academic specialising in 20th-century history. He was interested in and knowledgeable about the Bund. Majer was completely at home with him and what strikes me now, nearly 10 years on from that memorial, which every year to date, has always had a representative from the Polish embassy is Majer’s admiration for Zygielbojm as a Pole, a Jew and a socialist, who was dedicated to building a new society in Poland. Majer was proud of his command of Polish, the second among many languages he spoke, and he was always completely at home among fellow Poles. So we went to his room, and somehow, within this very institutional set-up, he had made it an oasis. There was a music system, a busy bookshelf and photos and posters on the walls and cupboards - it reminded me of a student room. Anyway, we sat down to talk, when suddenly he seemed a bit concerned. ‘How did you come here today?’ he asked. ‘By car' I replied. ‘But where did you park?’ he enquired. ‘It was OK today’, I assured him. ‘It’s a Bank Holiday - for May Day’. When I said those two words ‘May Day’, I saw a sparkle in his eyes. We must have spent the next half-hour talking about May Day - and how I wish I had had a tape recorder with me. I asked Majer about the first May Day he remembered and, as if it were last week, he described May Day in Piotrkow when he was seven years old - how the market square emptied out and everything was removed. then people started to set up the platform for the rally speakers and the red flags; how later the crowds would gather in the square from all directions. I remembered a conversation I had had with Majer some years earlier when we were talking about Jewish observence of festivals and he assured me that May day was the greatest yom tov.. We talked about May Day in the 1930s as the Bund became the most powerful force among Poland’s Jews, eclipsing the Zionist and religious parties. He described their joint efforts with the Polish Socialist Party (PPS) and socialist groups of Poland’s other minorities - Germans, Ukrainians, Lithuanians. He told me of the May Day march at the height of antisemitic agitation and violence, when the Bund’s children’s organisation wanted to head the parade. The Bund were fearful for their safety but didn’t want to say no to the children - who at that time they believed would be the leaders of tomorrow, not only of the Bund but of the wider Jewish and non-Jewish labour movement in Poland. Heavily stewarded, the children led the parade that year, and a few years later were led to their deaths by the Nazis. He told me of one May Day towards the end of the 1930s when the police intervened to prevent the Bund and the PPS from marching together - they had to hold separate marches in separate parts of town. As an act of defiance and solidarity, stewards from the Bund went to help keep the PPS march secure, and stewards from the PPS did likewise for the Bund; and at the closing rallies a speaker from each would address the other. It was very hard to have a conversation with Majer without learning something new, profound and challenging. We all miss him so much and hope that today’s event will help to preserve the memory of a true comrade .and a true mentsh. Majer Bogdanski has passed away. But humans are never absolutely dead. Majer Bogdanski lives in our memory. We met him while in London (from 1994 to 1999) and have stayed in touch through exchanging letters, ever since - his letters always written in his impeccable Polish. He was a small;'frail old man. Life was attempting to bend him towards the earth but with a radiant smile on his face, a face so wonderfully smooth for a 93 -year-old, he would bravely straighten himself up. He had the scampish grin of a happy child who had just won a lollipop (though such treats must have been rare or absent in his own poverty-stricken childhood), and he bestowed it generously on all around him, emanating a spiritual beauty that was difficult to resist. The very first time I met him, I fell under his spell. He could come up with the most delightful surprises. Once, on leaving a Chanuka party, during which he had sung Jewish prayers in his fine, strong voice, he suddenly struck up the Polish patriotic church hymn 'Boze cos Polske'. 'Well', he laughingly explained, on noticing my astonishment, 'during the war' (he had fought at Ancona and Monte Casino with the Anders Army), 'I had to lead my soldiers to Sunday mass, didn't I?" I loved him as if he were my own grandfather. He was a tsadik -the wonderful term used to describe him by a close friend at his funeral. He waas good, warm-hearted and wise, accepting with dignity and equanimity what fate had decreed for him. When he felt that his strength was beginning to fail and that he could no longer cope with the demands of daily life, he asked his friends to find a home for him. Although he had had to leave behind his trusty piano, he continued to work indefatigably at composing music to harrowing poems about the Holocaust. He would painstakingly copy out his compositions by hand and ask me to send them to their authors - Jerzy Ficowski and Wislawa Szymborska He wanted them to know that in far-off Albion an old Polish Jew had been touched by their poetry. I wanted to commemorate him in some way, to raise him up and make a hero of him, since for me he was one, but in so doing I lost sight of the real Majer and what made him truly great. A friend persuaded me to write to the Polish Ministry of Defence and ask whether they would consider conferring some award or other on Majer. I did so and received a positive response: they wanted to promote him to the rank of second lieutenant and also give him an award to acknowledge his deportation to Siberia and the time he spent in the Gulag. When Majer found out about this, he was resolutely opposed to the idea. In his opinion he had received what he deserved. He maintained that he did not feel hard done by and that not only would an award imply that he was due more than he had received, it would also undermine the decision of his commanding offcers. In addition, it would not be fair to his companions in arms and would be conduct unbefitting both a soldier and a civilian. He had fought because it was his duty as a soldier - he would not accept anything and that was the end of the matter! Just one more example of his high class!